The concept of ‘tonality’ or ‘tonal music’ has wide and far-reaching effects in music but it’s not always understood well. Today we’re going to clarify what the concept really is and what it means for you as a composer or a songwriter. So what is tonality in music? Tonality (also known as ‘tonal music’) is music that has a tonic – that specific note on which music is the most stable and at rest. In general, tonal music works by establishing a tonic, moving away from it and then returning to it. Having a tonic is a simple concept but it affects the way we understand music as we hear it, it affects its sense of direction, and it affects the musical structure too. Let’s dive right into this concept with some examples. The easiest way to understand what tonal music really means is to listen and, whenever possible, follow the score. 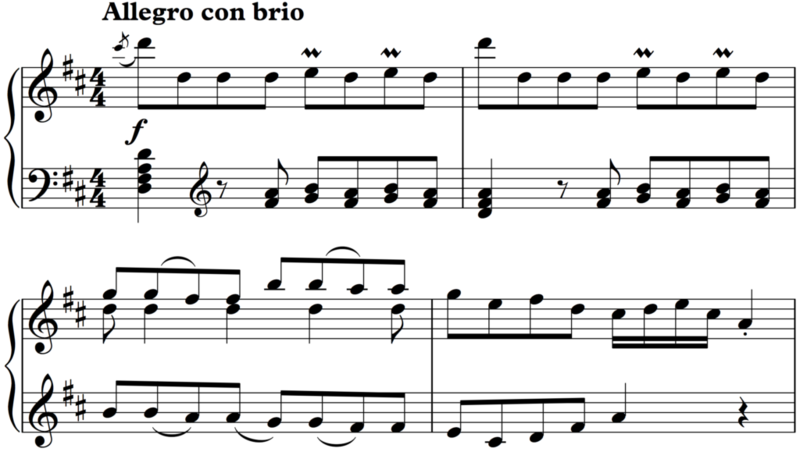 Here are 2 melodies from Beethoven – the second one is pretty much the same except for a slight change at the end. Which one of the two gives you the impression that the music has finished? We’ll get to the answer in a second but here’s another similar question, this time with melodies by Haydn. Which one of them gives you a sense that the music has ended? In both questions, the answer is the second phrase and the reason is that they finished on the tonic. If you didn’t hear it this way the first time around, go back and listen again. The tonic, also known as the tonal centre, is that particular note (and the chord built on it) on which the music is stable and at rest – it feels like home. Melodies and chord progressions are pulled towards it so no matter what happens throughout a piece or a song, the music tends to come back to it. Typically, music in this style begins on the tonic, wanders off for some time and eventually returns to the tonic. It’s really easy to demonstrate the effect of the tonic for yourself. Pick up any instrument or use an online keyboard and play the C major scale up to the 7th note. Leave it hanging there on the note B. How do you feel about it ending there? C major scale without final tonic. C major scale with final tonic. That final note is the tonic. And that is the psychological effect it has on us. It has a kind of gravitational pull that attracts every melody and chord progression towards it. Leaving the scale hanging on that 7th note creates a tension that resolves only when it finally moves to the tonic. In this sense, the tonic is like a sigh of relief, like coming home and sitting down after a long day at school or at work. Having a tonic normally means that the music is based on a major or minor scale. As you know from music theory, a scale is a set of notes with a specific pattern of half steps and whole steps. The major scale, for example, is a 7-note scale with a pattern of 2 whole steps, 1 half step, 3 whole steps and 1 half step. That pattern can start on any note and it will create different major scales. Composers use scales as the main resources for melodies and chords. Here are the scales of G major and F major. The note F sharp in G major and the note B flat in F major must be introduced so that the pattern of whole steps and half steps is preserved. Notice how the tonic note of the scale gives it its name. The G major scale is a major scale whose tonic is G. The F major scale is a major scale whose tonic is F. So the tonic really is all-important and music revolves around it. That’s why it makes sense to know the tonic also as the ‘tonal centre’. Clearly, Beethoven had all twelve notes of the musical alphabet to choose from but he chose to use just 7 – the ones that make up the F major scale, in fact. OK that’s easy enough to spot, the music is in F major. But if we look closer at the music we will see that out of these seven notes, there seem to be two – the F and the C – that are more important than the others. These notes are the only two that Beethoven wrote in the bass and they are significant because they are very long comparing to the short notes of the melody on top. What makes these two notes even more important is that this little four-bar theme begins and ends on them. It begins on the tonic chord and ends on the dominant chord (that’s the fifth chord of the scale). In tonal music, the dominant chord is just as important as the tonic because it’s the chord that makes us want the tonic. Even if we’re not aware of it, hearing the dominant chord makes us expect its tonic. Here we don’t have the time to get into all the psychoacoustic science behind why this is so, but let me just prove it to you with a very simple example. In just these 2 bars, listen to how the sound of the dominant chord creates the expectation of the tonic. Notice that when the tonic finally arrives, there is a sense of relief – a feeling of resolution. (In this extract we are in E flat which consists of E flat – F – G – A flat – B flat – C and D). The first part (with the lyrics “Wise men say only fools rush in”) begins on the tonic chord and moves to the dominant. The next part (with the lyrics “But I can’t help falling in love with you” continues where the first leaves off and eventually ends on the tonic bringing the line to a satisfactory conclusion. By ending the first phrase on the dominant, it invites a continuation. If it ended on the tonic, it would be complete by itself. The melody would be over too quickly! In tonal music this is known as functional harmony. It’s this strategic use of tonic, dominant and other chords to create expectations and resolving them when appropriate. Functional harmony determines how we experience this music and it explains the logic behind what we hear. The same thing happens in the Beethoven theme we’ve just been looking at. Why does the theme end on the dominant? Because Beethoven is telling us “Hey, stay tuned… there’s a lot more coming!” With the theme ending on the dominant, we expect to hear the tonic. That is what happens, in fact, but obviously the composer expands that tonic into the full first movement with as much drama as a Shakespeare play or a James Bond movie. By using the scale of F major in that simple 4-bar theme, Beethoven at once tells us that F is the tonic and that more is coming! This is the power of tonality within the major/minor system and functional harmony – it establishes a tonic, creates the ‘story’ by leaving it so that eventually we can return to a resolution on the tonic. So our picture of tonality is now getting clearer: tonal music is music that has a tonic and it normally works within the major/minor keys system and functional harmony. Our exploration of tonality cannot stop here, however, because there are two more fundamental elements that it influences. It’s the sense of direction and structure in music. Since music comes out of the tonic only to eventually return to it, then it means that the process of leaving and returning to tonic creates a sense of direction – an expectation that the music is, at some point, returning to that tonic just like we heard in the examples throughout this lesson. This sense of coming and going to tonic can be heard everywhere. Consider the simple tune to Twinkle, Twinkle Little Star. Starting out on tonic C, the melody skips to G and stays there after a brief visit to its neighbour note A. It then simply returns to end on C descending one step a time through F, E and D. In other words, leaving the tonic and then coming back to it is what guides the melody all along. Even in a simple children’s tune, we can see tonality in practice. What is really fascinating is that tonal music makes sense simply because it’s guided by these principles. Listeners don’t have to be aware of any of this to enjoy the music. In the example from Beethoven’s 6th symphony theme, we hear that there is something very satisfying with the melody ending on those particular notes at the fourth bar. It sounds like the destination of everything that’s happened before (bars 1 to 3) was this chord all along. In other words, the music has a strong sense of direction – with a clear arrival at this musical goal. As listeners, we do perceive music in terms of these musical goals. Once a musical goal is reached, we expect that the journey towards the next one begins and so on and so forth we experience the music in chunks or in sections. As we saw already, this is what creates the musical journey within a tonal composition – we leave tonic and return to it. On our way back to tonic, we might experience some ups and downs, some detours, some surprises and some tension (it all depends on the composer’s style and intentions) but eventually the drama resolves and the journey ends firmly on tonic. This is how the musical forms of the baroque, classical and romantic periods works. In the sonata form, for example, we get one or more themes based on the tonic key (the principal key), then we get one or more contrasting themes in the dominant key. This is followed by the development section in which the music travels to a variety of keys using bits and pieces of those themes we heard at the beginning. The whole thing then finishes with a return to the tonic. A similar idea is in the earlier dance music of the baroque style. We get a first section based on the tonic and a second section based on the dominant. The musical material of the second section could be very similar to that of the first because the change of key or ‘tonality’ (known as modulation) is enough of a contrast. So far we’ve learned that tonal music works by establishing a tonic, leaving the tonic and then returning to it. But how is the tonic established in the first place? And what does it actually mean to return to it? The answer is in the concept of consonance and dissonance. These terms refer to the level of tension inherent in any musical sound: from no tension at all to lots of it. Consonant intervals are pairs of notes that don’t have tension (they’re stable) and dissonant intervals are those that do have tension (they’re unstable). Whether the perfect fourth is consonant or dissonant usually depends on context. The same goes for the diminished fifth (or augmented fourth) but typically, it’s considered a dissonance. In tonal music, dissonance carries a certain energy that looks forward towards a resolution into consonance. Dissonance is unstable and it resolves into consonance, which is stable. The simplest and most important example of this is once again with the tonic and dominant polarities. Here is the dominant 7th chord of C major consisting of the notes G – B – D – F. That top F (the 7th) creates two dissonances. One with the note G (the root of the chord) and the other with the note B (the third of the chord). A dominant 7th chord consisting of a minor 7th and a diminished 5th above the root. Since this chord is dissonant, it requires a resolution into a consonance. By far, the most typical resolution of the unstable dominant 7th is into the stable tonic. The root G jumps to C, the third B moves a step up (just like it does in the ascending major scale), and the 7th F typically moves a step down to E (the third of the tonic). This is how the dissonance is normally controlled and resolved in tonal music. This simple progression, which moves from dissonance to consonance, is one of the quickest ways of establishing or returning to the tonic. It’s no wonder that, as we’ve seen today, this is one of the most common in all of tonal music. Is ‘tonality’ the same as ‘key’? The concept of tonality refers to music that works around a tonic. The term ‘key’ refers to the particular set of notes (the scale) on which any piece or section of music is based. But since the terms are so closely related, they are sometimes interchangeable. In a statement such as: “The tonality of this piece is F major”, ‘tonality’ is the same as ‘key’. Is there music that isn’t tonal, music that doesn’t have a tonic? Yes, there are several other systems. Some are older than tonality and others were developed in the 20th century. Examples include atonal music, bitonal music, polytonal music, and pandiatonicism. What is the difference between harmony and tonality? Tonality refers to music that has a tonic while harmony is the study of chords and chord progressions. Harmony is often tonal (with chord progressions based on the major and minor scales) but it can be of other types too.